The fitness plan she created for her players quickly grew into a much larger concept. Habib established a nonprofit called Mission2Move, which uses movement, meditation, and nutrition to combat childhood obesity and improve academic performance. She immediately incorporated its programming into classrooms just across the Golden Gate Bridge in the San Rafael City Schools district, serving roughly 250 elementary students for a full academic year and yielding positive reviews from the teachers involved. At Cincinnati Public Schools (CPS), some students don’t attend P.E. class every week. With Mission2Move, Habib plans to train academic teachers how to integrate small levels of movement into their classes through a program called Z-Health, a neurological approach to fitness that’s gaining traction throughout the western U.S. The idea, Habib says, is to engage muscles that are typically underdeveloped in sedentary children and ultimately increase their mental focus. Brain pathways that remain inactive eventually become fuzzy, like a map that slowly dissolves into a blur. “If we have kids sitting for eight hours a day, then their brains actually forget how their bodies move,” she says. The movements aim to strengthen those muscle-to-brain pathways. 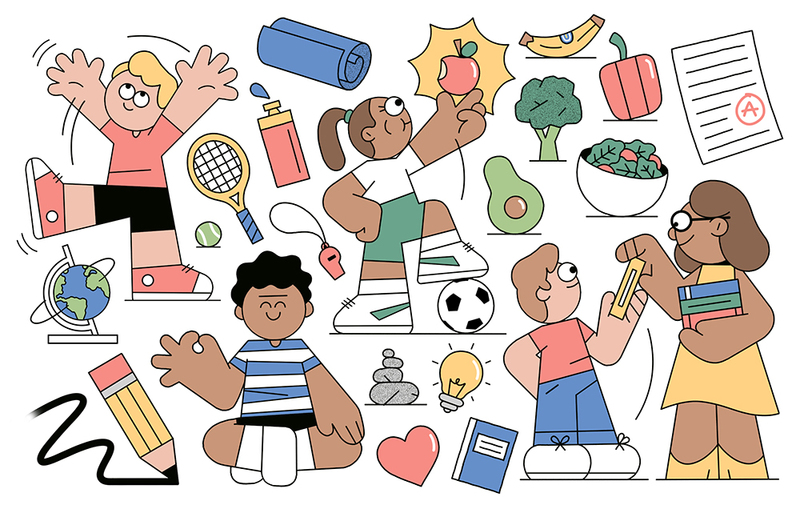 It’s a simple equation if you think about it: Small bits of physical activity lead to improved physical wellness, and those reignited pathways improve focus, which boosts learning. Habib’s early work with six Cincinnati afterschool programs this past academic year only further illustrated the need for her programming in CPS: children as young as first graders didn’t know how to skip, jump, or move their bodies backwards. She’s begun to describe this excessive inactivity as a movement gap, where inactive children are disadvantaged from success with focus or sports and are therefore more likely to develop childhood obesity. Never one to waste time, Habib trained all 60 of CPS’s physical educators as well as the academic teachers at Roberts Academy in the Z-Health curriculum last May. She says the goal now is to start younger. She received a $25,000 grant from the philanthropic AdvoCare Foundation to teach her Z-Health curriculum at Rising Stars Academy in one kindergarten, one first grade, and 10 preschool classes of about 20 students each who have never before received physical education. That’s all in addition to setting up preschool programs at John P. Parker, Woodford Paideia, and Winton Hills Academy, along with an opportunity on September 17 to teach Z-Health to all 120 CPS preschool teachers. Habib certainly doesn’t have small ideas. Just small students.